1 Chambre 1 Bain. Charge EV gratuite. Station de recharge électrique gratuite véhicule! D'autres combinaisons et les unités peuvent être disponibles. Besoin d'une salle de bains supplémentaire / chambre à coucher - il suffit d'appeler. 11) 45 minutes à Albany. Salles de bains supplémentaires peuvent être disponibles. Appel. La maison principale dispose de 5 chambres et 6 salles de bain complètes. Il ya quelques, mais pas beaucoup, les règles;) 1) ne meurent pas; 2) Amusez ou à laisser; et 3) Ceci est une propriété non-fumeur. Lacking only in minor details (worn cushions, some quickly resolved draining issues with the shower), this rental makes up for it everywhere else. Gorgeous home, spacious unit, convenient to Tanglewood, secluded, show stopping view, great amenities and outdoor space. Would recommend and stay again. I'm aware of the drain issue and try to check it occasionally. Susan cleaned and had me clear it before the next guests arrived. I took a look at the chairs and "They have to GO! I had no idea they were that bad. They'll either get new covers or get tossed. Hope you two come again. Tom was home to greet us when we pulled up to the property. He was very friendly and hospitable-- letting us know that if we needed anything that wasn't already in the apartment, just to text him or walk upstairs. The unit itself was spotless and very comfortable. Full kitchen made meals easy and the beds were comfortable. Also plenty of outdoor space to hang at the picnic tables or fire pits. Would definitely come back! Overall very satisfied with the clean, fully equipped kitchen, very spacious apartment. This is our second time staying at the Blonde apartment and we loved it even more because our friends were able to stay with us too. Tom was so accommodating because we had 7 people; 4 adults and 3 kids. The apartment was very spacious with a king bed and 2 pull out sleepers. We were greeted with a fruit bowl, all the appliances that we needed in the kitchen and toiletries. The house is conveniently located less than a mile from the ski slopes and the night view of the slopes from the house is just amazing. We'll definitely stay here again! Thank you Tom! Was much larger than I expected for a one bedroom. Perfect View of Jiminy Peak. Will stay there again I hope. The apartment was very clean and spacious, lovely and warm for our arrival. The apartment was excellent and very well located within key sight seeing areas of the Berkshires. I was impressed how clean it was and there was a lovely bowl of fruit on the table for us. The combustion stove is a winner and there were sufficient facilities in the kitchen for preparing food at home. The hosts were lovely and friendly and provided good local advice. The only thing to be aware of is that while the Blonde Apartment sleeps 6, which is fantastic, the two queen sofa beds are in the open living area with TV etc so the kids ended up staying awake until we were all in our beds. Having said that, I would still definitely stay there again. This was our second stay at this property. The property was very clean and well appointed. The friendly owner greeted us shortly after arriving and made sure to inform us that if we needed anything, just ask. There was a large bowl of fresh fruit on the kitchen table which was a nice touch. 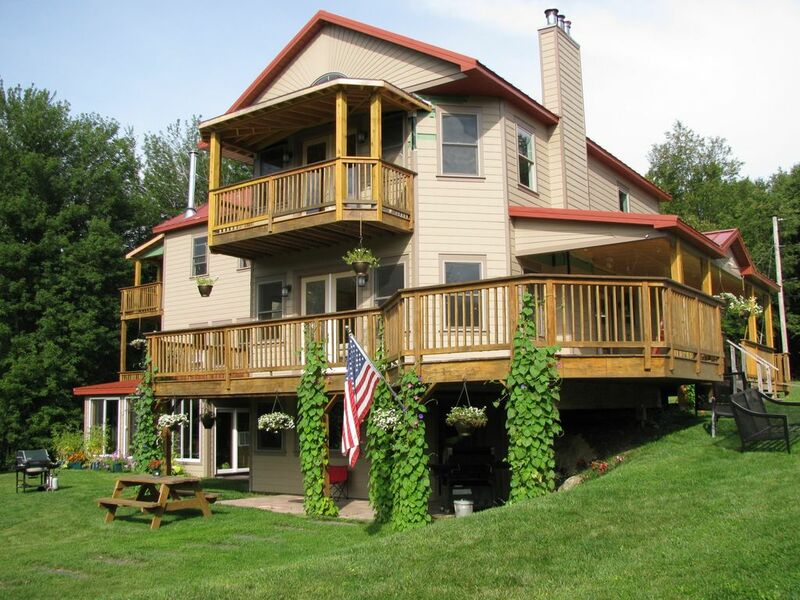 The property is situated in a peaceful wooded area with great views of Jiminy Peak Mountain. For a one bedroom apartment, the unit is very spacious. The bed was very comfortable and the bedroom was quiet. En hiver All Wheel Drive / 4 roues motrices est recommandé. Il est de ski de fond et de la Chambre est sur 'The Hill'.